This entry was posted on Tuesday, December 15th, 2009 at 4:18 pm and is filed under Aladdin Sane: 1973, Philips/Mercury Years: 1969-1970. You can follow any responses to this entry through the RSS 2.0 feed. Both comments and pings are currently closed. You know, it’a assumed that the song is about Angie but a song is really a poem and a poem is open to interpretation and can be about more than one person or thing. I wonder/suspect that Bowie had Marc Bolan in mind in the lyrics as well. Bowie has said that he and Marc Bolan met when they were painting Visconti’s office. It is pretty clear that Bowie was intensely competitive. The line “One day … you and I will rise up all the way, all because of what you are… the prettiest star. Well Bowie and Marc Bolan did “rise up all the way as glam rock stars and, speaking as a totally straight guy, Marc Bolan was very, very handsome – arguably the prettiest star. I had the pleasure of meeting Marc in ’72. I think therefore that Bowie may have had Marc Bolan in mind too, in Prettiest Star. A guess. My thought on it. I have a cool pic of T Rex with my brother on my facebook page, “Michael Jordan Rush” taken in a London clothing store in ’72. Feel fre to check it out. Marc was a sweet guy. He is missed. Ronson proper owns that lead guitar, he does a far better job. 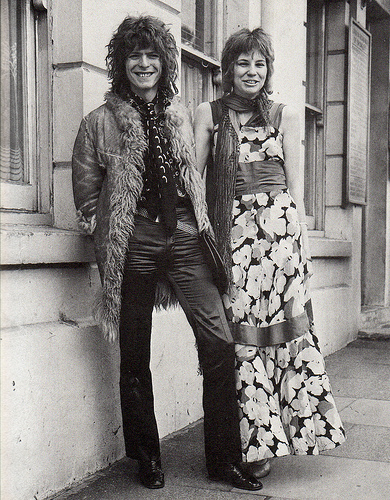 Trust Marc Bolan’s wife to say to Bowie that “he doesn’t deserve to play on your record”….Bowie outlived and outdid Bolan in less than a few years after and he’s still here! BOLAN did it far better than RONSON could ever, just my opinion as far as saying BOWIE outdid MARC i don’t think so.they are/were both glam rock icons! MARC BOLAN was idealized by DAVID BOWIE. TONY VISCONTI formed him into what he was.these two genius’s made DAVID BOWIE who he was back then and it still reflects on him to this day.if only BOLAN had more time to live!!!!! Reblogged this on Fancy These Things. 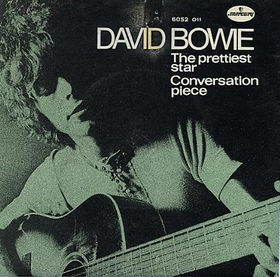 I would have loved to read some words on the b-side, the original version of “Conversation piece”, which I love. I still like it more than the A-side… Thanks for your wonderfull blog! I prefer the earlier version, now only available on the Sound + Vision comp. Most glam just sounds stupid to me, which may be be why it didn’t appeal to me at an age (11-12) when the difference between stupid and not-stupid became very important. Naturally, I went to prog. Anyway, I just finished the Rebel Rebel eBook. Now I’m at the stage where I’m flipping around it, listening to the song you are discussing, and trying to hear what you hear. It’s a tough job. I’ve been listening to this kind of music (“Rock”) since 1968. You disassemble it and put it back together again. Nice job.